I've been looking for yeast less pizza recipes for a while and this is the best I stumbled on. In a big bowl mix flour with salt and baking powder. Add 3/4 cup water and oil. Make a dough of this mixture. Stir until it forms a ball. If dough is stiff, add more water. 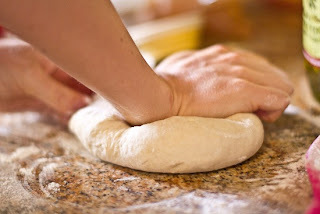 Knead on a floured surface for 3-4 minutes. really be happy to see the answers . . thank you.